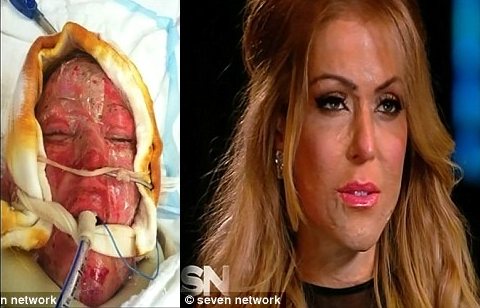 A woman who has been wearing a full body mask for over two years,following horrific burns,finally got to see her new face.The 28-year-old was doused with methylated spirits and set on fire in her own home by a woman jealous of her beauty on February 16, 2012. After 30 months of agonising reconstructive surgery and more than 30 procedures, Ms Vulin's new look was unrecognisable as that of the woman whose life had been hanging in the balance with third degrees to two-thirds of her body just a few years ago. Ms Vulin was on her sofa at home in Perth, Western Australia on February 16, 2012, when a woman's voice said: 'Hello, Dana. 'Natalie Dimitrovska, the jealous estranged wife of a man named Edin who Ms Vulin had met at a New Year’s Eve party, stood before her. Dimitrovska hurled a bottle of methylated spirits over Ms Vulin, a convicted drug user, while she was reportedly holding a lamp used for smoking crystal meth. On October 11 2013, Dimitrovska wept as she was jailed for 17 years for grievous bodily harm with intent. Since coming out of a coma, Dana has suffered agonising pain from her burns and has been forced to wear the pressure suit and mask between countless operations. ‘Not one minute of my day is the same. Your exterior is a representation of your interior, and this is not me…my skin and my burns and my scars are obviously a part of me now, but this is not me. I’ve not been able to wear earrings, I had no hair so I haven’t been able to do anything with my hair, I’ve been fashion repeating for over two years.